Pashmina Scarves Just $17.99! Down From $40! FREE Shipping! You are here: Home / Great Deals / Pashmina Scarves Just $17.99! Down From $40! FREE Shipping! For a limited time only! Hurry over to Jane to get these Personalized Pashmina Scarves for just $17.99 down from $39.99 PLUS FREE shipping! If you are looking for a stylish scarf with a plush cashmere feel, you’ve just found it! 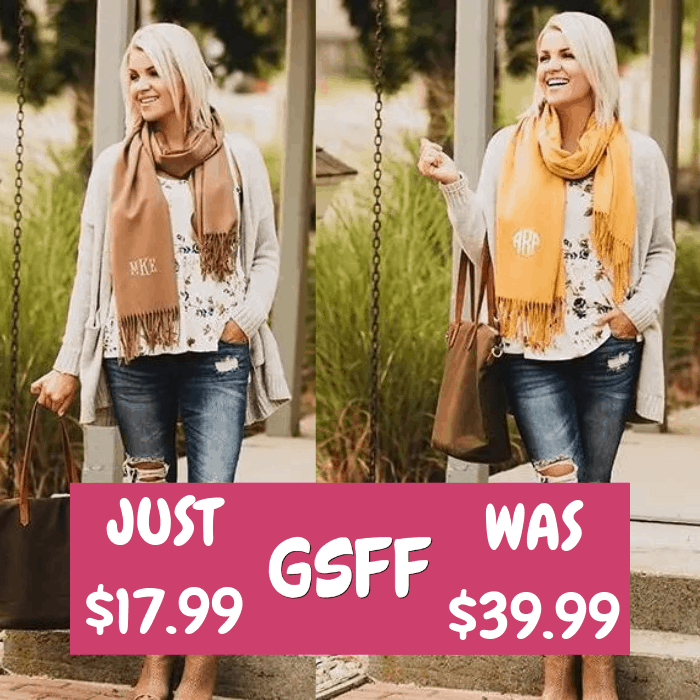 This beautifully monogrammed pashmina scarf is made with high-quality breathable blend fabric that is extremely luxurious and delightful to feel. It can be worn in a variety of ways and with whatever clothing you’d like to accessorize. Suitable for both autumn and winter, these scarves are also ideal in the spring or on a cool summer night. Use as a shawl in air-conditioned rooms as well. Choose from three different monogram styles to personalize for yourself and as a fabulous and welcome gift for any woman on your list. Classic accessories never go out of style and this monogrammed pashmina scarf will be sure to turn heads wherever you go.